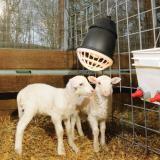 Rugged and reliable heat lamp used to warm lambs, goat kids, chickens, ducks, puppies or for any animal that is sick or cold. 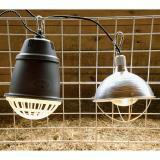 Common heat lamps are often blamed for barn fires, scorched wool and overheating. The “Prima” is better in every way—strength, safety, protective guard, and hanging system. Use standard or infrared (heat) bulbs no larger than 250W. 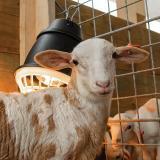 (We think 175 watt bulbs are best for lambs and kids.) Bulbs not included, but sold under accessories tab below. To warm lambs, goat kids and sick animals. 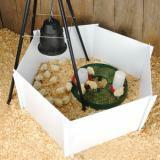 A heat source for a poultry brooder. Can be used in dog kennels for puppies and short-haired dogs. Use in barns or stables for any animal that is sick or cold. Uses infrared or regular bulbs up to 250W. The clear bulb gives more illumination. Red bulbs provide slightly more heat. “Never-loose” base—they don’t use cement adhesive. Instead, the base screws into the bulb. A weld of solder holds the base onto the threads. If a never-loose base ever becomes loose under normal use, we will replace at no cost! We prefer the pressed glass bulbs because of their tough and rugged PAR glass. To save energy $$, use a ThermoCube. 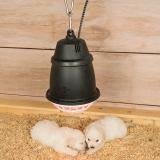 Heat Lamp Clips make hanging the heat lamp quick and easy. 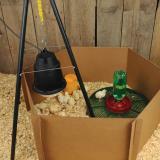 To help reduce pecking with your birds, use a red colored bulb. See replacement parts diagram above. Note: Even though we find our lamps safer than common metal lamps, we still take every precaution to reduce fire risk. 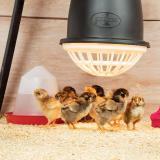 Keep the lamp at least 20" away from the ground and periodically check that the bulb is securely tightened in situations where the heat lamp may be jostled by animals. Hang the lamp at a height to match the situation. The recommended minimum distance from the lamp to the ground or lamb/kid is 20". 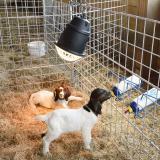 Prevent all livestock from coming in direct contact with the lamp. The lamp fixture should be secured so it will not be bashed, butted or knocked around. Bulbs will not survive hard impacts and become a fire risk when damaged. Thread power cord into a wire panel (see video above). If the heat lamp happens to get knocked free, the cord & panel will support the lamp until the lamp can be properly attached. Use a Heat Lamp Clip to secure the lamp to a panel. Do not use bulbs rated higher than 250W. Use high-quality bulbs. Some low quality bulbs have broken off leaving the metal filament in the ceramic fixture. Periodically check that the bulb is securely tightened. Do not use lamps in barrels for warming livestock. The heat needs to be able to move away from the lamp. It’s important to prevent adult animals from abusing (bashing, butting, etc.) the lamp fixture. When this happens, the bulb and fixture are at risk of damage. In mixed pens with mothers and babies, we take extra steps to protect the lamps from the adults (e.g. creep pens). PAR (pressed glass) bulbs are stronger, but because of their weight, they are more prone to separating from the base when repeated jostling occurs. Non-PAR bulbs shatter more easily when jostled, but are less likely to separate from the base. It’s important to periodically check that the bulb is securely tightened in situations where the heat lamp may be jostled by animals. Over time, these vibrations may cause the bulb to work itself loose. If the bulb becomes too loose, the electrical connection between the socket and bulb may fail causing an electrical discharge (arc) which is a fire risk and can permanently damage the lamp or bulb. Warning: Risk of electrical shock—Connect only to a branch circuit protected by a ground-fault circuit-interrupter (GFCI). Contact a qualified electrician if you cannot verify that the circuit is protected by a GFCI. A customer has reported problems screwing PAR (pressed glass) infrared bulbs into our heat lamp fixtures—so we’ve studied this in detail. 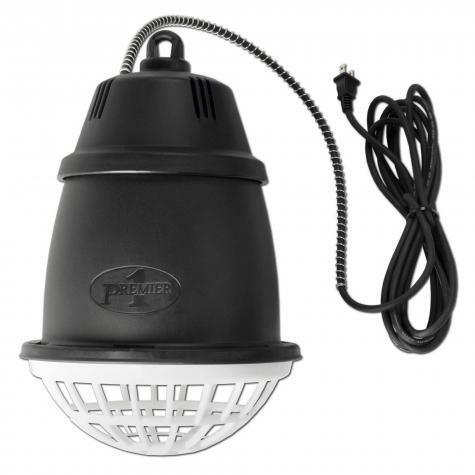 We have concluded that, because the PAR bulbs feel so sturdy and unbreakable in the hand (which they are), some users are inclined to screw them in with more hand strength than they use for normal heat lamp bulbs (which are fragile and feel that way). Using too much strength to tighten the bulbs doesn’t damage the bulbs—but it does deform the metal inside the ceramic fixtures of our heat lamps. Mild deformation due to over tightening makes it difficult to screw bulbs in and out of the fixture. Major deformation due to over tightening can flatten the metal so much that the bulb can actually fall out. Sturdy clip for hanging heat lamps. Spring latch securely holds lamps, even around ornery livestock. Replacement parts for Premier's Prim Heat Lamp. Ceramic fixtures available. Number of reviews: 333 customers reviewed this product. Recommended: 328 out of 333 said they would recommend this product to a friend. We find these much safer than metal and wire heat lamps. 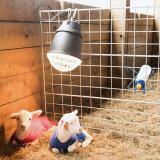 The lamps are mostly used in the lambing barn or the brooder. Even though we find our lamps safer than others, we take every precaution to make sure our lamps stay safe. We secure them 20" or more above the lambs/kids (slightly lower for chicks), we wrap the cord around our panels and we clip them to the panels. Wow, this lamp is sturdy, it has a nice thick feel to the molding and definitely put me at ease vs the other options! Interesting. These lamps suggest a long list of precautions, many of which I have blatantly ignored (except, of course, the fire-hazard ones). I have sheep with big, heavy, horns, and to put the lamps high enough for clearance, they would be useless in the kind of winter MN had this year. The bulbs I first installed were the high-priced never-loose bulbs (which themselves caution against battering). When those 175w pressed-glass bulbs quickly failed (they came loose from the base), I replaced with the 250w cheap ones and my critters were much happier. My rams LOVE to pound their horns against the barn pillars - right near the lamps - and the guards have NOT suffered any damage. I docked my rating one star because while keeping the guard grids secure is VERY important, the grid is QUITE difficult to loosen for bulb-change. I would encourage Prima to investigate a means to keep the security, but increase the human-accessibility factor. Well worth every penny. This lamp is just as advertised. Heavy duty, reliable, easy to hang and has been keeping my Kunekune piglets as snug as can be. Safety is #1. This product is rugged and much safer than the metal ones that are much cheaper. The heavy plastic shield is great. We have a sheep farm and the new lambs need some warmth when it is very cold. The mothers would bend and destroy the metal ones by leaning against them. We purchased 2 last year and bought 4 more this year. We no longer worry about fire or the animals getting burned.